Members of the Hillsboro Fifth Grade Student Council are pictured giving a presentation at Monday’s Hillsboro Board of Education meeting. The Hillsboro City Schools are planning to build a new 800-seat auditorium. A recommendation to request bids for the project from architectural firms was unanimously approved at a Monday’s meeting of the Hillsboro Board of Education. The school district’s estimated cost of the project is $6 million. The proposal includes plans for a 23,000-square-foot addition to the existing high school with two locker rooms. Superintendent Tim Davis said that while there will not be an orchestra pit like in the old high school auditorium, there will be an elevated stage with seating gradually inclining toward the back of the seating area. He said the locker rooms will primarily be for cast members during performances — one designated for males and one for females — and will include an area where they change and apply makeup. “This is just the start of the process,” Davis said. He said a notice that bids are being accepted by the school district will go out immediately, that the hopeful goal is to see construction started this summer, and that once construction starts, the project will take about 16 months to complete, depending on weather and other factors. Board Member Larry Lyons pointed out that the current high school/middle school building was constructed in anticipation of additions. The auditorium will be located on the back side of the building, which was finished with metal sheeting rather than brick. Lyons said it will be located behind the gym, between two exits at the back the building. Lyons also noted Monday that during next month’s meeting, the board will be looking at additional spending for extra security measures. The board also presented a proposed calendar for the 2019-20 school year that would have school starting on Wednesday, Aug. 14. Davis said several staff members commented that they did not want to start the school year with a five-day week. Davis said students would have the day off on Nov. 1 — the day after trick or treat — for a teacher development day, get two full weeks off for Christmas break, and get March 15-20 (the 20th will be another teacher development day) for spring break. In other business, the board unanimously approved the following supplemental contracts: Anthony Amore, varsity girls track; Abby Baker, middle school girls track; Gary Breeden, high school softball assistant; Anthony Carson, assistant varsity track; Zach Cowan, middle school boys track; Matt Garman, varsity baseball; Ethan Hurtt, high school boys track assistant; Bud Marsh, varsity boys track; Darci Miles, middle school boys track; Ben Miller, assistant baseball; Katie Moberly, varsity softball; Duston Richards, assistant baseball; Matt Schneider, middle school girls track; and Larue Turner, boys tennis. 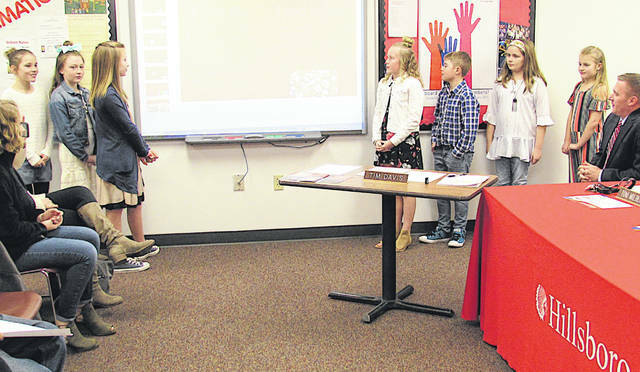 https://www.timesgazette.com/wp-content/uploads/sites/33/2019/01/web1_School-Board-pic.jpgMembers of the Hillsboro Fifth Grade Student Council are pictured giving a presentation at Monday’s Hillsboro Board of Education meeting.